Green Cross Pharmacy (GCP) was the original source of PrEP when Davie Buyers Club first launched in June 2016. Shipping issues from FedEx and then DHL made it impossible to continue in late 2016. After a long hiatus from DBC, I can endorse GCP again after several observed trial shipments (and many other reports) successfully received in the USA. GCP now ships with EMS Singpost and offers the lowest-priced PrEP online at $85 USD for a three month supply, including shipping. GCP is based in Swaziland (a country next to South Africa) and their products ship directly from the supplier in India. GCP will ship either RICOVIR-EM by Mylan or TENVIR-EM by Cipla, depending on your preference. Both versions of emtricitabine/tenofovir 200/300mg are US-FDA approved and have been validated using therapeutic drug monitoring by 56 Dean Street clinic in London (see FAQ for more info). Mylan’s product was approved by Health Canada on 31-July-2017. Cipla’s product has not been reviewed by Health Canada. The price is $85.15 USD for TENVIR-EM, which at the time of this authorship, was $109.53 CAD. Click here for the current exchange rate via Google. The price of RICOVIR-EM is the same, but shipping of RICOVIR-EM appears to be much greater. Both products also a “handling fee” of less than $7 CAD. These are the total costs which includes 90 tablets and express shipping to the USA via EMS. The website or your credit card company’s conversion rate may be slightly inflated compared to the base rate quoted by Google. Note: the purchase platform of the website cannot be completed on a smartphone or tablet. Use a desktop computer. If using an Apple computer, do not use Safari or Netscape — use Google Chrome instead. On the linked-page above for either TENVIR-EM or RICOVIR-EM, a quantity of “1” is a 90 day supply. Choose standard shipping and press Continue. Step 1, Complete your order: follow the shopping cart all the way through until it offers “Submit Your Order”, the next page gives you an order number. Write down the Order Number that is shown on this page. You will need it later. You will need a digital copy of your prescription and the details page of your passport (for customs clearance purposes). A scanner is ideal, but a very carefully taken photograph using a smartphone may work — make sure that the lighting is good and that all information is clearly visible. Most phones and scanners create images in .jpg format, but the shipper requires them to be in .pdf format. Use the free website tool JPG 2 PDF to quickly convert your files by dragging them in to the space that says “Drop your files here”, wait a few seconds for them to convert, then click Download below each file to save the pdf files to your computer. Enter your name, your email and your order number. Select the images of your prescription and passport. Please note: a user has reported that some credit cards treat transactions using Exchange4Free as cash advances rather than purchases, which means that they may begin accruing interest right away (and do so until your full balance is paid off). If possible, pay off your credit card ASAP to avoid interest. This link will then be taken to the Exchange4Free payment gateway so that the US Dollar amount can be converted to Canadian Dollars and you can complete your payment. 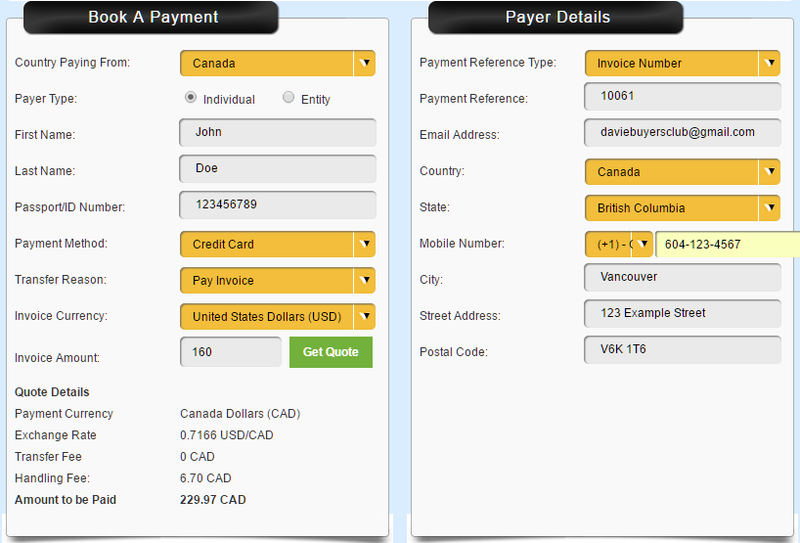 Now click the GET QUOTE button ONCE only and the cost of your order in Canadian Dollars will be shown. You will then be given a reference number and the Canadian dollar amount will appear and the credit card option will be selected. Click on the SUBMIT button. Now you will be able to enter your credit/debit card information and billing address in the normal way when using your card online before clicking PAY. Occaisonally you might be asked to join an “online verfication” system. Just continue on. Your payment is not complete until you reach the page with the large green heading “Payment Successful”. After completing your transaction you will receive an email as well as a text confirmation that your payment has been processed. You have now completed the order process! You will receive an email notice including tracking when your parcel ships, usually within 48 hours. You can track your parcel here. It typically takes 8-14 days for the medication to arrive in Point Roberts. -Most problems arise from using an incompatible browser on an Apple computer. Safari and Netscape are NOT compatible — use Google Chrome instead. The purchase platform cannot be run on an iPad, tablet, or phone. Use a desktop computer. **If you do not receive a confirmation email/text that your payment has been received within 24h, it is likely that your credit card company has automatically blocked the transaction (how often do you buy things from Swaziland, right?) Contact Tracey (above) to confirm this is the issue and/or call your credit card company to authorize the transaction. The phone number is usually on the back of your credit card.